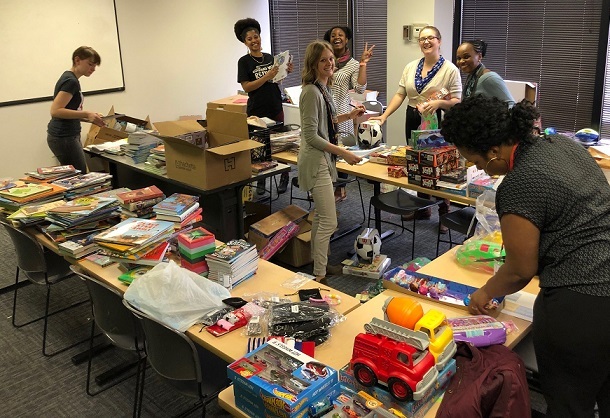 Every year, as the holiday season approaches, New AP reaches out to the Atlanta community to ask for “Secret Santa” gifts to share with the refugees we serve. We want to show refugees that all are welcome and treasured here, and that the season of giving applies to everyone. With nearly 200 children in our afterschool programs alone, we wonder each year if we will receive a gift for everyone. And every year, we are inspired by – frankly, blown away by – the generosity of our community. Not only did our Secret Santas help us share gifts with all of our Bright Futures refugee youth, they enabled us to provide gifts for newly arriving families and other women, children and families served through our longer term programs like Parents as Teachers, English at Home and ongoing case management. Here’s video footage of our refugee children in one elementary school thanking donors for their gifts. And, we have chosen a few great photos from the Bright Futures afterschool holiday parties. Thanks to ALL of our Secret Santas for making the season bright year after year for the families we serve!